Welcome to Fall TV Week at io9, where we'll be giving you the inside scoop on some of the upcoming TV shows. 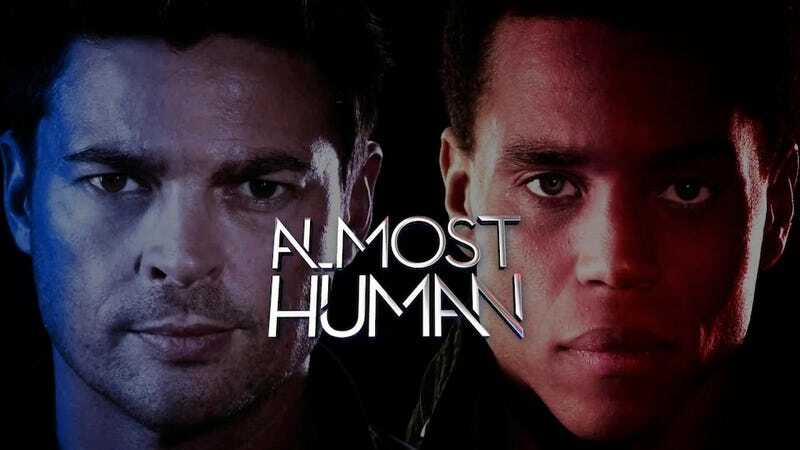 First up: Almost Human, the new show from Fringe's Joel Wyman and J.J. Abrams. We talked to stars Karl Urban and Michael Ealy about how the show makes you root for androids the way Fringe did for mad scientists. In Almost Human, Urban plays John Kennex, a cop in a near-future world where every human has to be paired with a robot partner. After a mission goes horribly wrong, Kennex wakes up from a coma to find he's got an artificial leg, and he winds up pairing up with Dorian (Michael Ealy), the last remaining example of an experimental line of emotional androids. Your character hates robots. But isn't he part robot, because of the leg? Doesn't that make things more complicated for him? One of the elements that attracted me to Almost Human, apart obviously from J.J. [Abrams] and Joel [Wyman] and this amazing cast, was the character of John Kennex and his story. I found it intriguing that this character wakes up after two years and finds himself, you know, in an unfamiliar world. He's kind of like a dinosaur, and he has to learn how to operate in this society, and not only function and protect and serve the citizens of the city, but then also deal with the baggage of his past, which obviously includes this apprehensive feeling that he has towards anything robotic, because it feels that it's partly responsible for the loss of his buddies. And then, to wake up and find himself settled with this bio-mechanical leg, is pouring salt on his wound. And meanwhile, he's hacking his own his brain, trying to regain his lost memories. Yeah, I found that really interesting. Not only is he trying to do his job, but he's trying to reclaim aspects of his life that are just out of bounds for him. He is a bit of a tormented soul in that regard. I think it's wonderful what Joel has done — the way that he's written these two characters of Dorian, the android detective, and John Kennex, the human, and the way that they are forced to interact with each other. I think it's fertile ground for a lot of conflict [and] a lot of comedy, and I believe that relationship is the core of the show. How has Dorian changed Kennex's perspective? My character's perspective? I feel like at the beginning of the pilot, the character of John Kennex is kind of in a shell. He's beaten up, and he's been through a really tough time, and he has a lot of anger, bitterness, resentment, guilt and pain. And he has a very kind of set vision, I think, of technology and of androids — and in the course of getting to work with Dorian, I think, that kind of engineers a little bit of a paradigm shift. That's realy interesting. That's just the beginning of the story, just a little crack of light. Can you talk about working with Michael Ealy? It seems like you have a lot of chemistry with him. He is fantastic. I just feel so blessed to be working with him, and not only a testament to the great guy he is but also J.J. Abrams, that’s what he does so well — he puts together really wonderful ensembles, great groups of people. He did it in Fringe. He did it in Lost and Alias, [and] he did int in Star Trek, obviously and he's done it again here. I feel really blessed to be a part of this. We're really excited about the interplay between your character and Karl Urban. How did you guys go about developing that cyborg-android buddy-cop relationship? You know, I think the writers and the creator Joel [Wyman] have done all the work, really. We just breathe life into these characters. How do you go about playing an android in a way that feels fresh and new? Was there anything you borrowed from? I tried really hard to avoid all the cliches of being a "droid" on television. But so far, I've been able to avoid those. What do you feel the cliches are that you're trying to avoid? Just, you know, the simpler [versions]. The thing about Dorian is, he's more human than he is machine. So that kind of gives me more freedom not to go down that robotic path. It feels like over the course of the pilot, you and Karl Urban go from having this uneasy vibe of not really getting along, to being more like friends. Do you think we'll see that continue to develop in the following episodes? Yeah, I can definitely tell you that right now. I've read the next couple of episodes, and we are continuously trying to develop our relationship. I feel like we have to earn the title of "buddy cop." You know, because we definitely don't get along at first. We have our differences. And call it discrimination, call it prejudice, call it what you want — but it's definitely there. You guys are going to be the outsiders in the police department. Nobody else likes you guys, right? Is there going to be some more humor coming up in the scripts? More banter? Definitely, but it's not forced. We don't want to force it. It's a drama. But there's always some truth in jest. So what we like to do is put out the truth — and if you find that funny, great. But Dorian definitely has a sense of humor, right? He always has kind of a smirk on his face, and he's always kind of laughing at things. Is that something that you thought about, bringing that in there? You know what it is [is] I think Dorian is extremely observant, and reacting to what he sees around him is amusing. And, you know, you can't always tell what he's thinking. And I kind of like that. What we're going to see in later episodes is, exactly what's going on in his head sometimes. What he sees. Because he can see stuff that humans can't see. We're going to get more of the Dorian-eye view? Absolutely. The POV of Dorian. We've learned a lot about Kennex's past. Are we going to learn more about Dorian's past, from when he was shut down? Absolutely. It's actually quite fascinating. I was talking to the creators about it. It's quite fascinating. I can't wait to play it. Note: We talked to Karl Urban in a roundtable with a few other reporters, but we had a one-on-one with Michael Ealy.